Not strictly related to The A Forest, but I got my pre-order package of the Kid Canaveral album in the post this morning, and as you can see from the picture it’s a nice wee bundle. 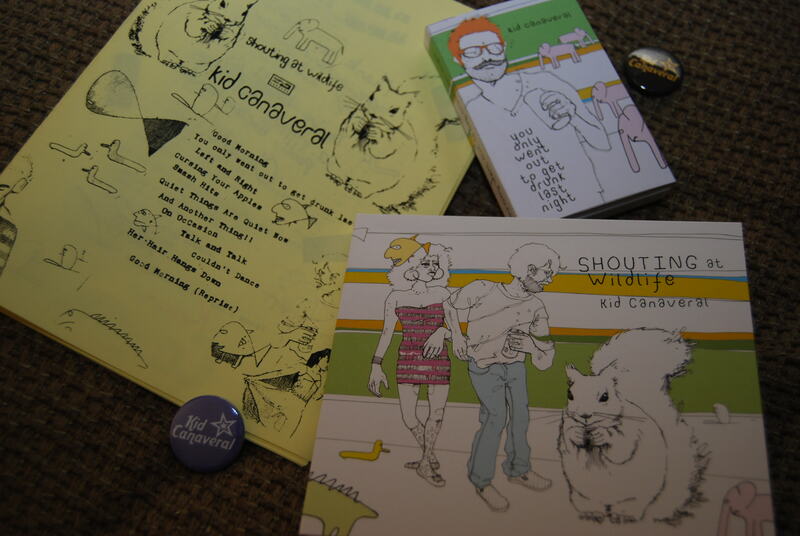 For a tenner plus postage you get the CD album, a cassette single of “You Only Went Out To Get Drunk Last Night” featuring a couple of remixes (including one from Kwaing Creasite), a fanzine-style lyric booklet and a couple of badges. I can’t imagine any of these cost that much extra to produce, but it’s a nice touch and I think a good way to encourage people to get involved early. Of course Kid Canaveral are not the first band to take this approach, but I think that these days its become more and more important to throw in little extras to help stand out and give people a little something extra. I’ve been thinking of ways to make the physical version of our album a little more appealing as I get closer to placing orders and making commitments, but I think the physical product is going to be quite appealing in itself. So, if there’s anyone out there reading, what do you think? “Polar White” has hit the Top 10! Okay, it’s the amazingtunes.com top 10, but you’ve got to start somewhere! I think if enough people play/download/rate “Polar White” on their website, there’s a chance it’ll make it on to the playlist of digital station Amazing Radio. We were at #5 when I checked. Other than that, the word seems to be spreading slowly. We’ve had shout-outs on AyeTunes and the German blog White Tapes. I’m hoping that if enough people describe me as a “photographer” it’ll become true. Things are moving along with the physical version of the album. Artwork has been commissioned so hopefully we’ll be in a position to order the physical copies by the end of the month. I’m also looking into wider digital distro and getting on Spotify. If you’ve not downloaded it already, you can get “Polar White” for free here. Tell your friends too! As a taster of the forthcoming album, you can download the first single now for free (well, in exchange for your email address) from Bandcamp. “Polar White” shows off the more electronic side of the band, with programmed drums and layered keyboards. A second single will follow before the release of the album later in the summer. Once upon a time I had a go at writing a general blog, mostly about music, photography and films. It’s a lot harder than it looks. One of the ideas I had (stolen from someone else) was to write a wee bit about each of the bands I have been in. I only got as far as my first school band, but ended up writing a tangential post about some early demos by The A Forest. They have a certain rough charm, but by no means should be viewed as any way representative of the album! As you can see, our website has been updated to a blog format. The old one hadn’t been touched for a long time, but to be fair there hadn’t been much to update. Hopefully that has now changed! We now have the final master for our eagerly anticipated album, and it sounds lovely! We are unlikely to be able to play live to promote it, so I thought it would be good to keep a blog about the whole thing. That’s all for now, I guess.